Now that your drawing is on your watercolor paper, you can secure it to a foam core board with masking tape. Be sure to cover at least 1/2 inch of the paper all the way around. This will ensure that the paper will remain held by the tape while applying your wet washes. Watercolor paper, especially 140 lb paper, will buckle when wet, so the tape will prevent it from buckling too much and as the paper dries, the tape will secure it so that it will dry quite flat. This is a great help when trying to frame a painting! I want to add masking to this project to keep the white of the paper, and to subsequently save some of the lighter values as I paint. (see previous post for the beginning of this project) Masking fluid is fragile and dries out quickly. To preserve the bulk of the masking fluid, I pour a tiny amount into a very small, resealable container. I keep the top on the larger container and only remove the top when pouring some masking into my smaller container. I also have another container with a chunk of a bar of soap and water (you can also use a concentrated dishwashing liquid). This is helpful in preserving your brush. The third thing is a cheap brush with a fine point. Brushes used for masking should never be used for watercolors and visa versa. Masking is very hard on brushes, so cheap little brushes, brush handles, even toothpicks, are very useful for this application. The first thing in masking is to dip the brush in the soapy liquid. I like to use the bar of soap because it makes the soapy liquid very thick. I really dunk the brush in this solution and thoroughly coat it. Then, dip the soapy brush into the masking fluid and apply it thoughtfully to the painting. 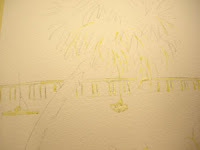 The masking fluid will resist the paint, and so it will save the whites and lights. Thoughtful brushwork here is crucial. 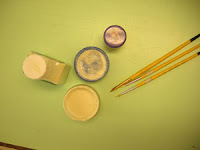 Whatever marks you make with the masking will be on your painting. If you are careless or sloppy, the marks will not make sense when the masking is removed later in the painting. Continue to dip the brush in the soapy liquid, then into the masking. Do not mix any of your tools or liquids with the tools or water used for your regular painting. Ever. Period! Masking will ruin your good watercolor brushes, and even if you get a little in your water container, it can then get into your paints and brushes and ruin them!!! Again, I cannot emphasize enough, how important it is to use thoughtful brush strokes in the application of your masking. I masked some of the lightest areas of the palm tree, making sure the masking described the direction and character of the long palm fronds. I also added some to the green grasses and shrubs in the foreground, the bridge, the tiny building shapes at the right, and I covered the boat shapes in the water. Be frugal, we will add more masking later as we add a little color. 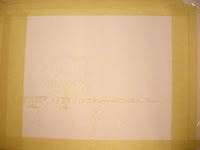 Allow the masking to air dry, if you use a hair dryer, it can "bake" the masking into the watercolor paper and make it difficult to remove in the last stage. If you are local to the Melbourne, Florida area, you can find out more about my classes here in the area. Visit my website for more information: http://watercolorworksart.com/Classes.